Stevie Mac on Gretch Drums is Back! 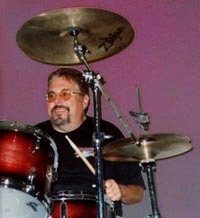 Steve McDowell has been banging drums for the Lord since the seventies. He is a sought after session player in the San Joaquin valley and veteran of numerous touring acts including VISITOR. He has a real heart for the Lord and isn't afraid of "hard drivin" to serve Him. Steve plays Gretch® drums and Zildjian® cymbals.